With a vinyl deck surface, your deck maintenance is virtually non-existent. To look its best, your vinyl deck should be cleaned 4 times per year using the Duradek Vinyl Cleaner. This environmentally safe cleaner is available from your authorized Duradek Dealer, Duradek Headquarters or order online from Amazon (Amazon.ca). It is designed specifically for vinyl and will NOT leave harmful chemical residue like many household cleaners may. Simply follow the directions on the label. Start with warm water and a stiff broom, scrubbing in a circular motion to loosen the dirt. The textured surface is ideal for slip resistance but does provide a place for dirt to settle, so the circular scrubbing motion will help pull that out. Then spray with a garden hose (under pressure) to wash away the loose dirt. You may also use a pressure washer with a setting of no more than 1500 psi (max) and hold the nozzle 12 inches from the surface. Be careful to avoid seams, railing attachments, caulking or house trims. Finally, flush thoroughly with clean water. This is a very important step of deck maintenance as you do not want any remaining residue on the deck surface. The sunshine can cause a reaction with cleaning agents on your vinyl deck surface so it is important to rinse your deck thoroughly of all cleaner residue. If acid rain or airborne pollution is a problem in your area, you may want to clean your deck more frequently. The only other deck maintenance for Duradek vinyl decks is your annual inspection. It is the home owner’s responsibility to inspect the caulking used to seal around posts, pillars, corners, vents, and drains. Over time, the structure to which the vinyl sheeting is applied can crack, shrink or shift which can break the caulking seal. A yearly inspection will uncover such a problem and your Duradek contractor can recommend or supply the proper sealant to correct it. To protect Duradek vinyl deck surfaces from scuffs or excessive wear, use non-rubber backed* mats (polypropylene ok) at doorways, stair landings or major traffic thoroughfares. Select mats that are heavy enough not to blow away. Avoid dragging heavy or sharp-edged objects on the vinyl surface as that can cause scuffs or tears and must be protected against. * Rubber based products are not compatible with PVC. Duradek easily withstands even the harshest winter conditions and common methods of snow and ice removal. It is fine to use a snow shovel, just be sure it is a plastic edged shovel – not a metal edge. It is also safe to use de-icing agents such as kitty litter (gravel style), rock salt or other snow-melting chemicals. Just be sure to clean the surface thoroughly with soap and water and rinse very thoroughly before the spring sun arrives which can ‘bake’ any remaining chemical residue into the Duradek membrane. DURADEK VINYL CLEANER OFFERS THE BEST RESULTS FOR EVEN TOUGH STAINS. These alternate cleaning solutions are an option for tough stains that our vinyl cleaner is unable to remove. If trying one of these options, there is a risk of leaving a residue which can affect the performance or appearance of your Duradek vinyl deck surface. These options are to be done at your own risk and MUST be done when vinyl is cool to the touch and not in direct sunlight/peak heat of the day. If damage occurs during or as a result of the cleaning process, it is the owner’s responsibility to repair. Always use cleaners as directed by the manufacturer, and always follow any cleaning with a flush of clean water. A: Apply warm, soapy water for a few minutes to let the chemical action of the cleaner begin to “loosen” the dirt. Scrub with a relatively stiff bristle scrub brush in a north-south direction for a few minutes. Scrub in an east-west direction for a few minutes. Rinse well with water and let dry. B: FANTASTIK spray cleaner, Simple Green, or Formula 409 All-Purpose spray cleaner (only for a few minutes) water rinse/dry; or Cascade Powdered Dish Detergent with water, water rinse/dry. C: One (1) tablespoon ammonia to one (1) quart water; water rinse/dry. D: Wipe or scrape off excess (chill gum with ice). E: Duradek Vinyl Cleaner gets the best results. Rust is very difficult to remove and should be cleaned immediately. F: Sun exposure over time will fade this stain type. G: One-third (1/3) cup powered household detergent, four (4) cups household liquid bleach, two-thirds (2/3) cup Trisodium Phosphate, Twelve (12) cups water; OR Clorox Outdoor bleach at One (1) part bleach to Six (6) parts water. Use rubber gloves with these options. Rinse well. H. Citrus based engine cleaner, water rinse/dry. I. Citrus based asphalt & tar remover, water rinse/dry. J. Spray Aqua Net Hairspray directly onto the pitch or sap mark, then wipe off, water rinse well/dry with lint-free cloth. * Suntan lotions, wet leaves, cedar, permanent markers, rubber and some other products contain dyes that permanently stain. 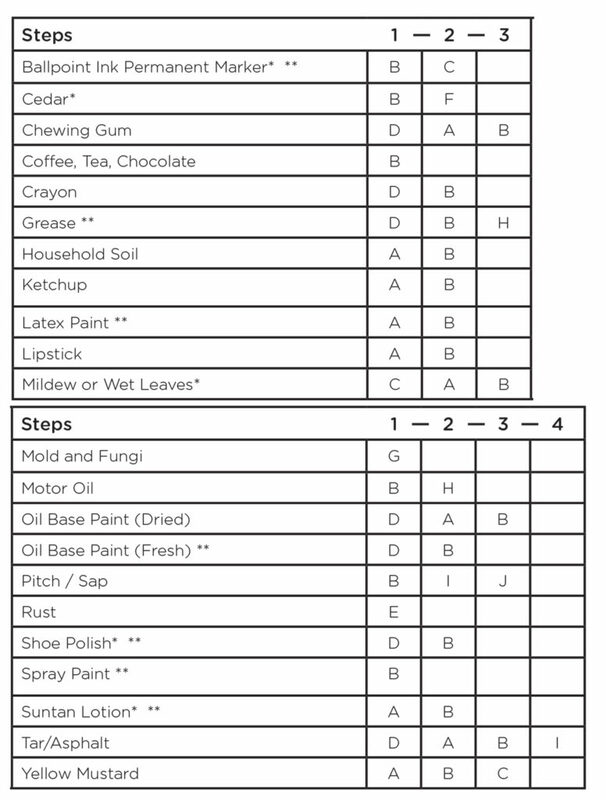 ** Follow instructions of staining agent manufacturer. Caution – Do not attempt to clean stains, paint or any blemish using any undiluted bleach, acetone, turpentine, lacquer thinner, ketone, acid or multipurpose stain or paint remover as you may cause removal of the vinyl print. Cleaning solutions must be dabbed, NOT rubbed. Clean well with cleanser and water, and then flush thoroughly with lots of clean water. Always test on an ‘out of the way’ place to ensure there will be no problems with the cleaning agent you’ve selected.